We, as a nation, are in need of redefining what is disposable and what is not. 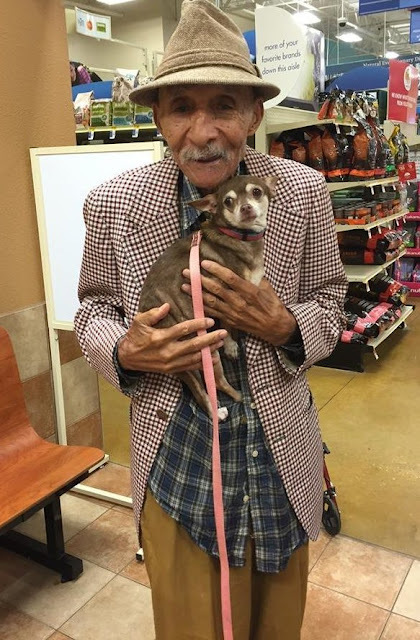 Allen, a 90 year old WWII veteran, at a Dallas pet adoption event. His dog had recently died and his Meals on Wheels volunteer took him to pick out a new companion. Coco, a 3 years old Chihuahua, was brought to the shelter because her owner no longer had time for a dog. The shelter manager commented, "It was truly love at first sight." "He didn't even want to let her go long enough to do the paperwork." "A disposable society is only fit for disposable people."